Charles Lyell. Travels in North America; With Geological Observations on the United States, Canada, And Nova Scotia. London, 1845. "Birds-eye View of the Falls of Niagara & Adjacent Country. Colored Geologically." The distinguished geologist Charles Lyell traveled to America in 1841, touring New England and the mid-West. 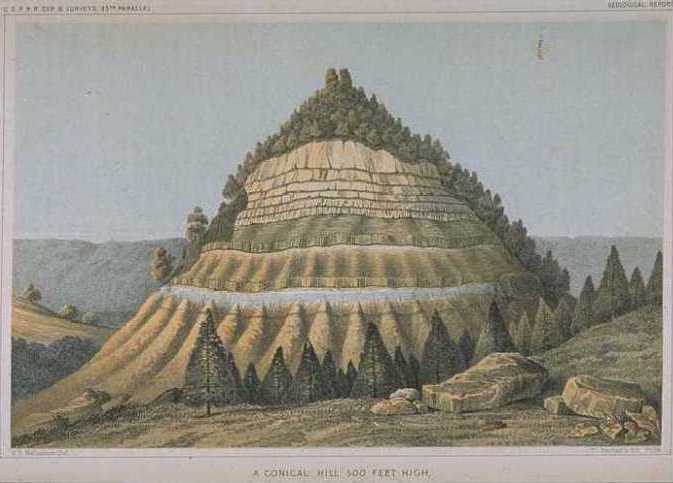 The frontispiece to his work is an interesting use of perspective and color to reveal the geological structure of the country around Niagara Falls. It also reveals Lyell's serious scientific purpose, immediately billing his work as differing from that of a casual tourist. David Dale Owen. Report of a Geological Survey of Wisconsin, Iowa, and Minnesota; and Incidentally of a Portion of Nebraska Territory.... Philadelphia. 1852. "Series of Sections on the Des Moines River in Iowa between Raccoon and Lizard Forks." Owen, the son of the famed Scotish reformer Robert Owen, moved to the United States after his father bought New Harmony, Indiana to found a utopian community there. He became a geologist and directed several important geological surveys in the Mid-West. 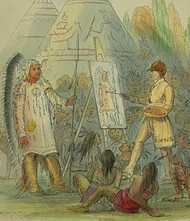 In this work, his primary publication, Owen experimented with a variety of techniques to illustrate the work. 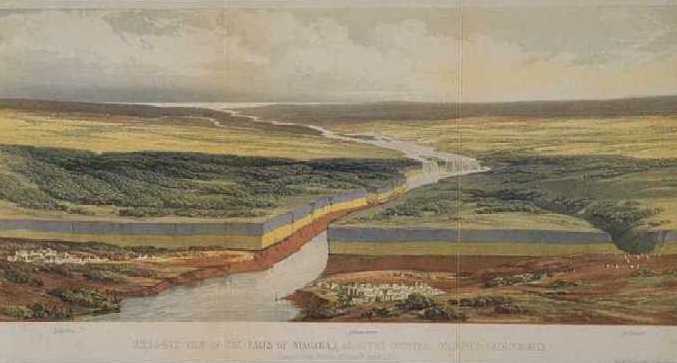 The plate shown here combines landscape with colored crosssections within the picture to reveal geology. In the same book Owen published the first steel engraving of a scientific subject made from a daguerreotype. Howard Stansbury. Exploration and Survey of the Valley of the Great Salt Lake of Utah Including a Reconnaissance of a New Route through the Rocky Mountains. Philadelphia, 1852. 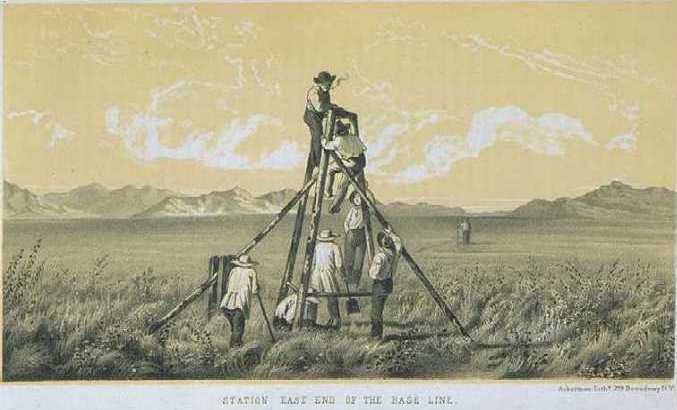 Stansbury undertook the first extensive survey of the Great Basin in 1849 and 1850. His report appeared the same year as Owen's survey of Iowa and Wisconsin, and together they set a standard for illustration which inspired the makers of the Railroad Survey. Their clear, illustrative plates far were removed from the romantic vistas of Fremont's report nine years before. This plate showing a crew in the field conveys the painstaking effort of survey work. Pacific Railroad Surveys. Reports of Explorations and Surveys, to Ascertain the most Practicable and Economical Route for a Railroad from the Mississippi River to the Pacific Ocean.... Washington, 1855-56. Among the high points of the Railroad Survey illustrations are the panoramas by Egloffstein showing sections of the proposed central railroad route, the path later taken by the Central Pacific. Here some 70 miles of the country in western Nevada are shown in meticulous detail, with smoke rising from imaginary campfires to show the route the survey party took. The Pacific Railroad Survey is an extraordinary cornucopia of maps and views, the latter rendered in woodcut, steel engraving, and tinted and colored lithographs. The plates cover a broad spectrum of subjects from general views to specific geological illustration, as in this plate. The vast scale of the Railroad Survey, publishing thousands of images in tens of thousands of copies, was a far cry from the meager illustrations of the first generation of American surveys.